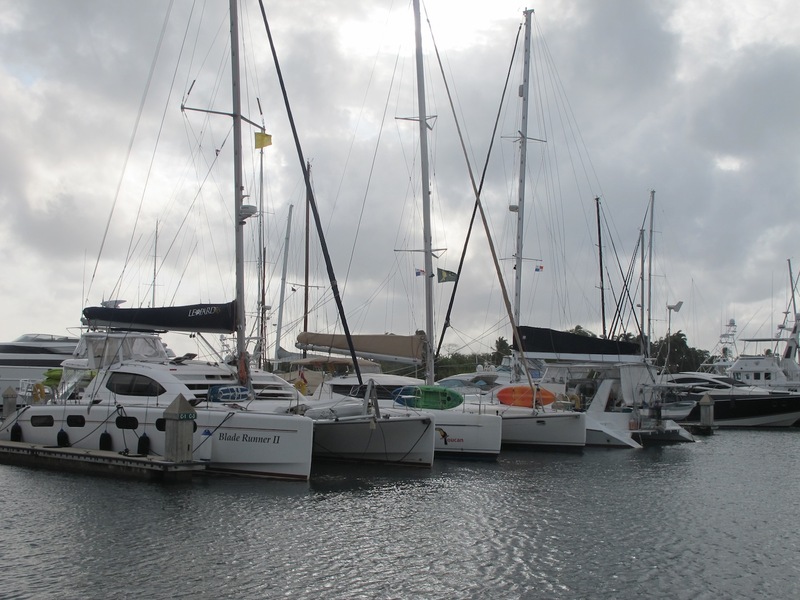 We had an easy 23NM sail from Portobelo to Cristobal Harbour, and the beginning of the Panama Canal. As we approached, more and more ‘targets’ popped up on the screen, many at anchor but a fair number moving in and out of the Canal. It was quite a sight. Feeling very small and insignificant we radioed Cristobal Signal tower and requested permission to come in and make our way to Shelter Bay Marina. Ooh our little blue triangle is a bit insignificant amongst all the orange monsters! Waiting for this guy to exit the harbour before we went in, very wise I think! There aren’t too many options re anchoring around here – “The Flats” is the only official anchorage for small vessels, but it’s in the commercial part of the harbour and quite isolated, so security is a concern and it looked almost impossible to land your dinghy anywhere. 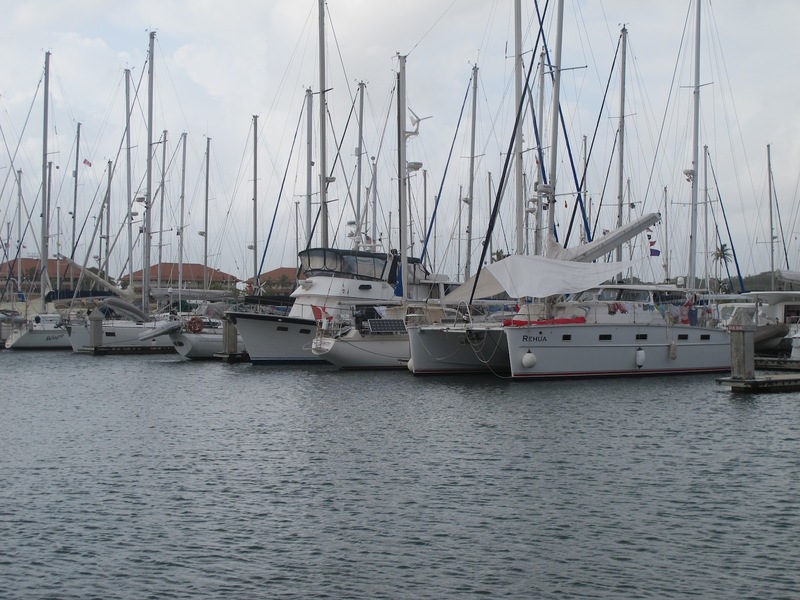 As you may have gathered by now, we much prefer to anchor than go to a marina, but in this case we didn’t have much option, particularly as we wanted to get a stainless steel pole fabricated for our wind generator that we’ve been carting around since Grenada. 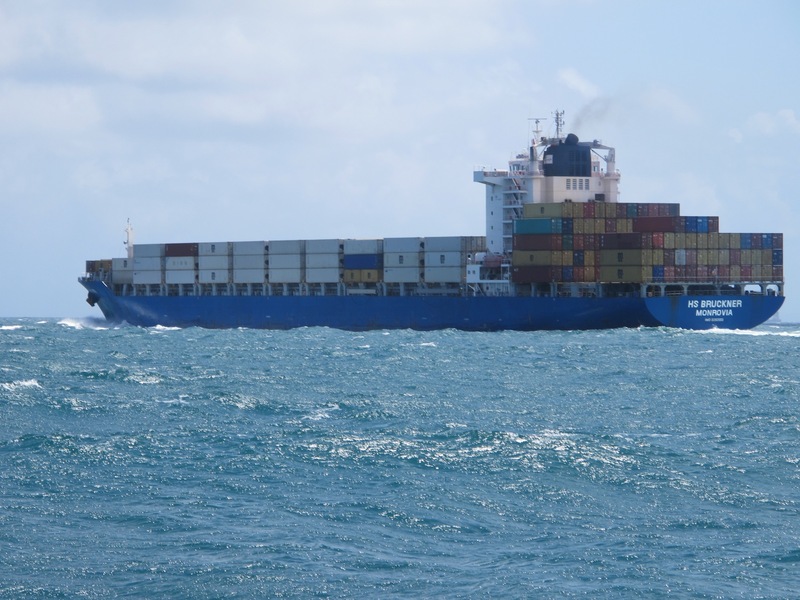 We also had a lot of provisioning to do before heading off across the Pacific. So Shelter Bay Marina it was (better known as “Shelter Pay Marina” – our berth cost us US$82 a night, plus electricity). The manager, John, is very helpful and friendly but I imagine he struggles to keep the place running efficiently. 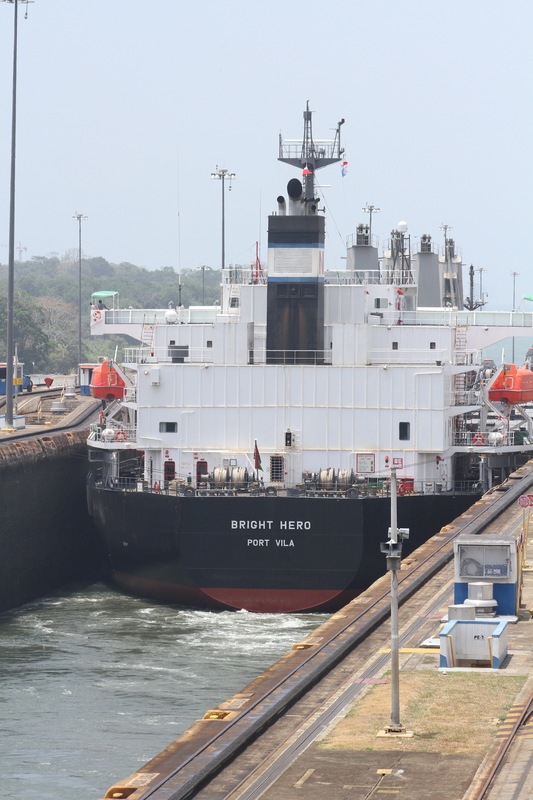 In fact, the words “Panama” and “efficiency” are definitely mutually exclusive. In the time we spent there, the bar ran out of beer 3 times (they offered us Bud Light, but that really doesn’t count as beer), it took 3 days for our friends on ‘Rehua’ to sort out an incorrect bill at the restaurant, the courtesy bus into town broke down, the chandlery seemingly opened whenever the employee didn’t have something more important to do, the power went out on the day our welder was supposed to come, and the pool was out of action for three days because someone decided they couldn’t be bothered to get out and use the toilet. Charming! Despite that, it was convenient to be on the dock for topping up water and getting provisions onto the boat. 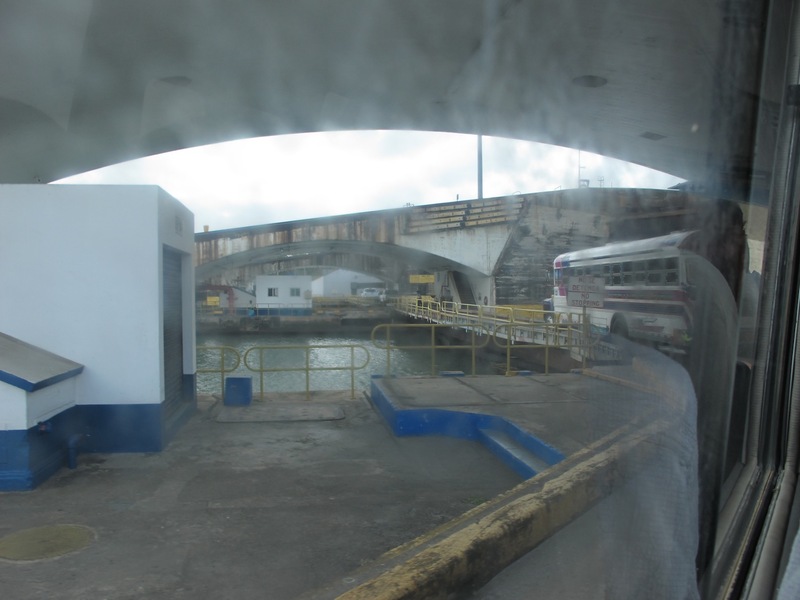 The bus went into Colon twice a day – it can be quite a lengthy trip if the Gatun Locks are closed. 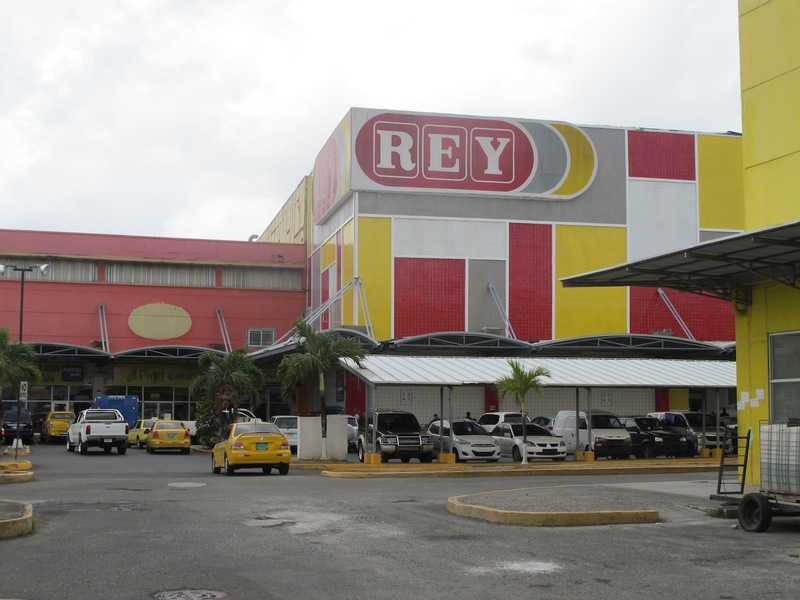 Provisioning was reasonable at Rey Supermarket, but trying to get boat bits and parts was much harder. For a place that has such a high turn-over of yachts coming and going it seemed incredible that the local chandleries weren’t taking more advantage of the profit they could make. Roy Bravo, our agent for the canal transit, came to see us soon after we arrived and organized for the Admeasurer to come the next day and provide us with our official Panama Canal number. As we’re a bit late in the season, we could have got a slot almost immediately, but we needed to wait for the stainless fabricator. As it turned out, we needed all the time we had just to get provisioning and other jobs done, and to get enough cash to pay Roy for our transit (with all fees and costs it came to roughly US$2000). We’d hoped to be able to do a bank transfer to his account, but for some reason the NAB bank in Australia will let you do international transfers to every obscure third-world country you can think of, but not to Panama. There was no ATM at the marina, so we had to make several bus trips into town to take out the daily cash limit on our card. We got very familiar with that bus ride! Our friends from ‘Rehua’ and ‘Blade Runner II’ were also at the Marina, so we had some good social times, and as cruisers do, helped each other out with spare parts or muscle power when needed. 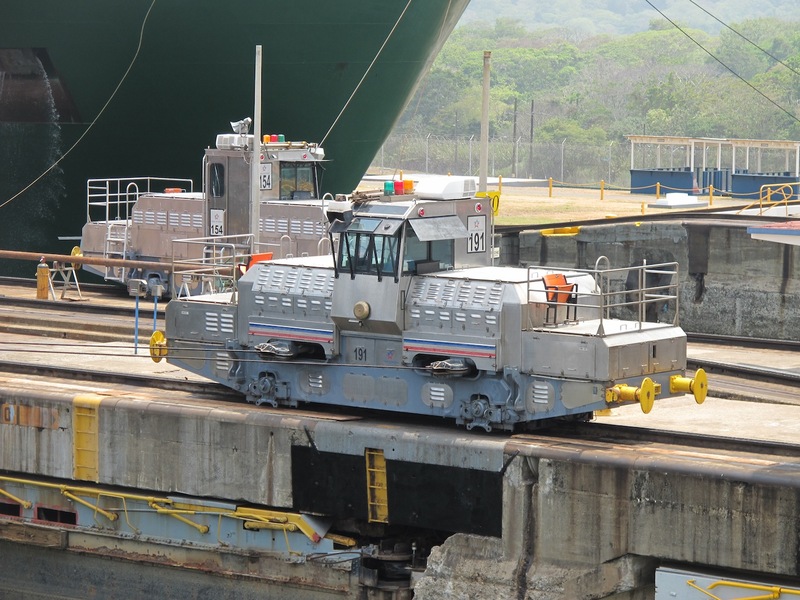 We did a recce to Gatun Locks with Rehua to see what we were in store for. It was certainly impressive and just a wee bit daunting! tight squeeze for these big boys in the lock, hope we don’t get one of these behind us! The trains that pull the big ships through. We get real people throwing us lines. 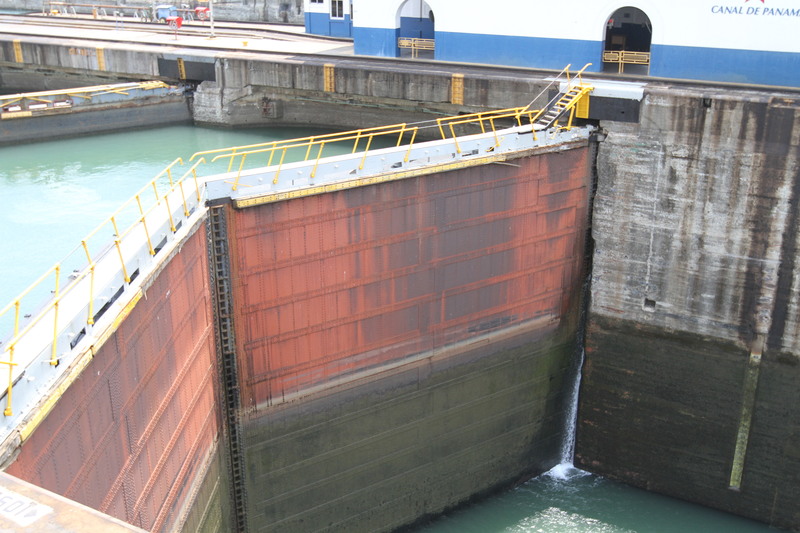 The monstrous Gatun Lock gates. Just look at that water level difference! Geoff, Bruce and Sean in contemplative mode. Are we worried? No! 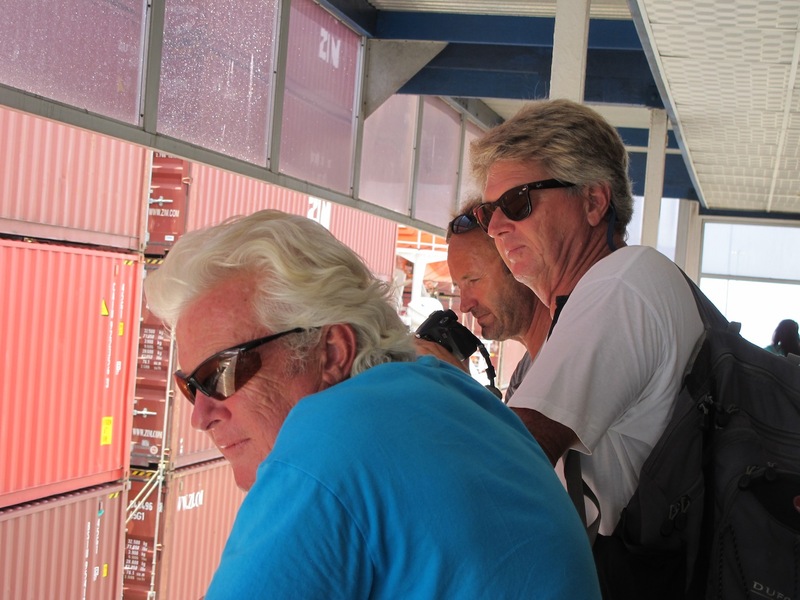 We also got to know the young Panamanian guy who was minding the sport fishing boat opposite us – Johnny spoke no English and even though I’m trying to learn Spanish, my repertoire is limited to about 5 phrases. He was grateful for some of our food and beer, and in return tried to help me with my Spanish so all in all it was a good trade! The time ticked by and still our welder hadn’t turned up. We’d been promised he would get the job done by Tuesday, so we’d booked our transit for Wednesday. The hours went by and the stress levels on Toucan started to rise, but finally he arrived at 3pm on Tuesday. To his credit, he worked into the evening and by 8pm we had a pole and two braces in place. We realised we really needed a third brace but it was too late – he left us the stainless steel piping with a promise to come and fix it for us on Friday morning once we were on the other side of the canal. Hmm, it’ll be interesting to see if he turns up. 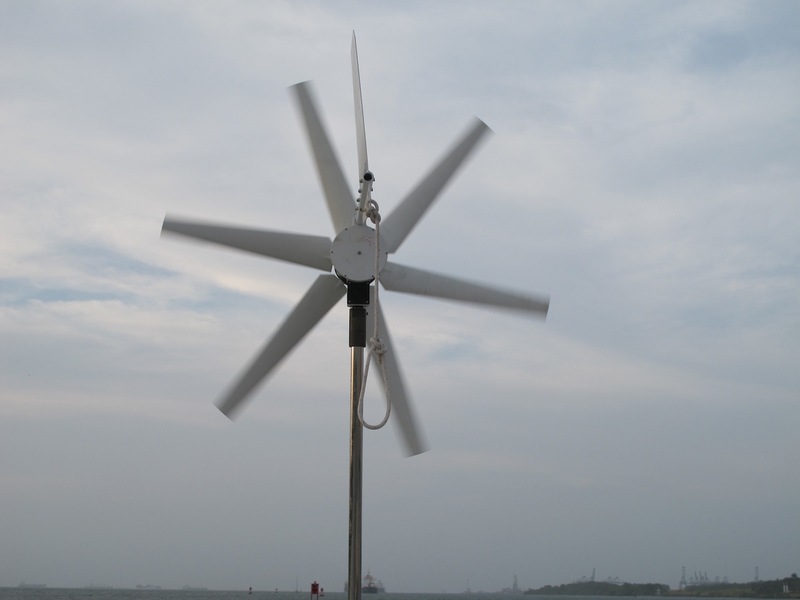 Finally – the wind generator is mounted and working! All in all, it’s been quite a stressful time trying to get everything organized, not just for the canal transit, but also all the paperwork required for Galapagos and French Polynesia. The regulations seem to get stricter and stricter with each passing year. Wish we’d been out here doing this 10 years ago, I’m sure it was much easier (and cheaper) then. But even all the bureaucracy and paperwork couldn’t dampen the excitement as the day of our transit dawned. So wish us luck and we’ll see you on the other side! Jeez…… what an experience the Canal must have been! Anyway see you made it safely and have made it to the Galapagos Islands! Watch out for the guano!! Take care and love to you both.